Floors have to work hard these days. They must either unobtrusively complement the rest of the interior, or create the wow-factor. Those with high traffic must be hard-wearing, and increasingly able to accommodate multiple uses (is it an office, is it an event space?). Every business is looking to make its property work as hard as possible, and clear demarcation across increasingly fluid spaces can help fulfil these functions. This is true externally as well as internally. Outdoors that could be a publicly accessed square going from a daytime al fresco market to a live-music venue at night. Some flooring is even stretched so far as to double as signage, a trick learnt long ago by retailers hoping to guide shoppers around merchandising units via variously coloured carpet tiles. Changes in the workplace have had a particular impact on flooring choices. Areas with a single function have given way to 'activity-based working' in which office workers bounce from bench-desking to bar stool and back again. 'Across the open environment there are now a multiplicity of microcosms, each with its own identity and requiring appropriate dressing,' says James Scully, chief designer and managing director of Quadrant Carpets. Such a variety of uses plays into the hands of the pattern makers. London-based tile designer-maker Lubna Chowdhary is a strong advocate, as is Israeli design studio Beija Flor, which prints vinyl with its own take on ancient tiles. Likewise, Studio Job's new Industry Amber tile collection for Italian brand Bisazza is inspired by Britain's industrial revolution. And similarly is Frame by DesignTaleStudio, the in-house research lab of high-end Italian tile manufacturer Ceramiche. The Frame collection is all about highly graphic tiles based on the traditional clay majolica tile and 'marks a return to colour and decoration in tiles', according to Ceramiche. With modern takes on old timers by Bisazza, Ceramiche, Beija Flor and others, we've come a long way since those early floorboard-effect laminates. Normally flooring's chief aim is to protect users from the building structure, and vice versa. 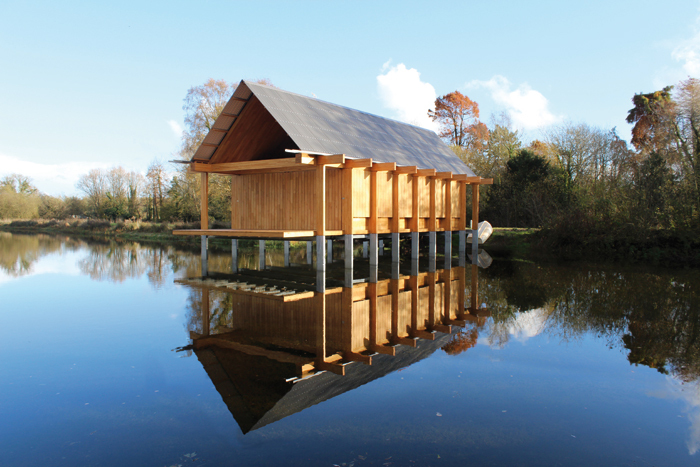 But in a fishing hut in Hampshire, Niall McLaughlin Architects has intentionally left a view between the timber boards on to the lake below.